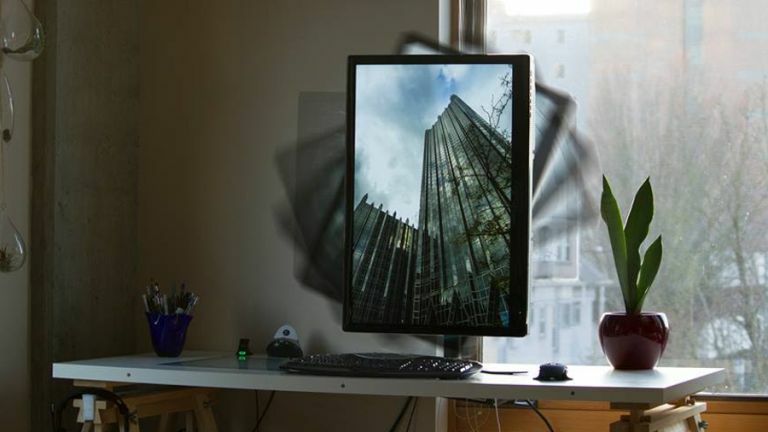 A nifty new monitor accessory has come to light which allows you to swiftly rotate your display through 90 degrees, just as you'd flip your smartphone from landscape to portrait (or vice versa) to better view content on-screen. Rotato is a motorised monitor accessory which has just gone live on Kickstarter, with just under three weeks to go to reach its funding goal of $35,000 (around £22,500). The accessory fits between your display and its existing stand via a VESA mount, and it'spowered with a simple USB connection. With one press of a customisable hotkey on your keyboard, Rotato will smoothly spin your monitor around and reorient your desktop to match the new position – fast enough so the rotation will be complete before the operating system can redraw the screen in portrait (or landscape). As the makers of Rotato note, rotating swiftly into portrait mode is a great boon for a number of tasks, including coding, looking at photos in their proper orientation, viewing whole pages of a document at once, or seeing more results on-screen when you're searching the web. Safety measures are built in, too – if the monitor screen hits an obstruction as it's being rotated, Rotato won't blindly continue to attempt the rotation process until something breaks. Rather, it will stop and reverse, returning to its original orientation, and allowing you to shift the obstacle out of the way before you hit the rotate button again. Rotato (we have to say, the name puts us more in mind of potatoes than rotation, but there you go) is certainly a neat looking and innovative idea, though funding has only just crept up to $1,300 (about £840) as of the time of writing.